Rep. Paul Renner, who represents all of Flagler County in the state House and is in line to be the Speaker of the House in 2022, took criticism earlier this year for pushing bills that diminish or eliminate home rule-the political principle that local matters are best left for city and county governments to decide. The state Legislature is becoming more aggressive in "pre-empting" local laws, meaning forbidding local governments from passing laws that go further than state law. Renner has been supportive of that approach, and appears to be becoming more so. Regarding vacation rentals, he said today that "it's much, much more likely that a bill that goes pretty far in the direction of preemption is passed than not." But speaking on WNZF Radio's Free For All Fridays this morning, Renner for the first time went much further, putting his philosophy in a larger context: state pre-emption will happen more and more in coming years because it reflects an ideological battle developing between a conservative state Legislature and more liberal urban centers such as Miami, St. Petersburg, Orlando and Jacksonville. All those cities have passed or tried to pass more progressive ordinances, whether to set a living wage at $15 an hour, require new homes to add solar panels, forbid the sale of puppies from puppy mills-or restrict vacation rentals. The cities are enacting those ordinances within their home-rule authority. To Renner and the conservative Florida Legislature, the cities are going "rogue" the moment they give room to liberal policies, whatever their constituency. Renner's avowal is startling for the degree to which he is essentially equating local autonomy as an affront to state authority, when that local autonomy differs ideologically from prevailing philosophies in the state house. The Senate Community Affairs Committee has drawn the lines for next session's home rule battle. When a bill lifting local regulations on home-sharing rentals offered by companies like Airbnb sailed through the House last session, Sen. Tom Lee, R-Brandon, thought senators had a "superficial" understanding of the issue. Senators let the proposal die on the Senate floor. Sen. Greg Steube, R-Bradenton, sponsored last year's proposal preempting local ordinances and said he will do so again for the upcoming session. Lee wanted the Senate to be prepared. "Sometimes we don't take up an issue until someone files a bill and that's a little too late to be learning," Lee said Tuesday. "I wanted to workshop this upfront because it is starting to have an impact not only on the hotel restaurant industry but on homeowners' associations and even in some cases property tax rolls." In recent years, the Legislature has thrown out local ordinances on guns, drones, ride-sharing, marijuana dispensaries and gas station signage. Lawmakers attacking vacation rentals ordinances say the state needs a uniform rule that protects property rights. The Florida Legislature is currently in session. Much like last year, there are bills being discussed that would preempt all regulation and licensing of vacation rentals to the State. The primary bill related to vacation rentals is Senate Bill 1400 (Steube), titled the Florida Vacation Rental Act. The City is opposed to this bill because if it passes, the City of Pompano Beach would be stripped of its power to regulate and enforce regulations and licensing requirements for Vacation Rentals. If you reach out to your Senators, please remember to focus on the impact of the short term rentals on the quality of life for the residents of your neighborhood. You may want to also suggest that if it is adopted, the Senate consider making revisions to SB 1400 that would allow the State to fine, suspend, or revoke the license of any vacation rental when there are repeat violations of any local law or ordinance governing noise, sanitation, garbage or parking. 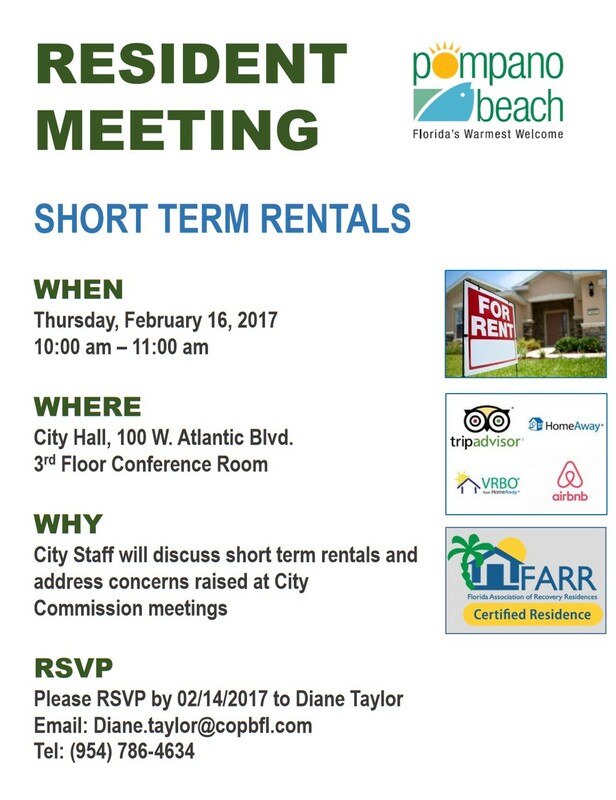 The Short Term Rental Staff Taskforce was established in December 2016. 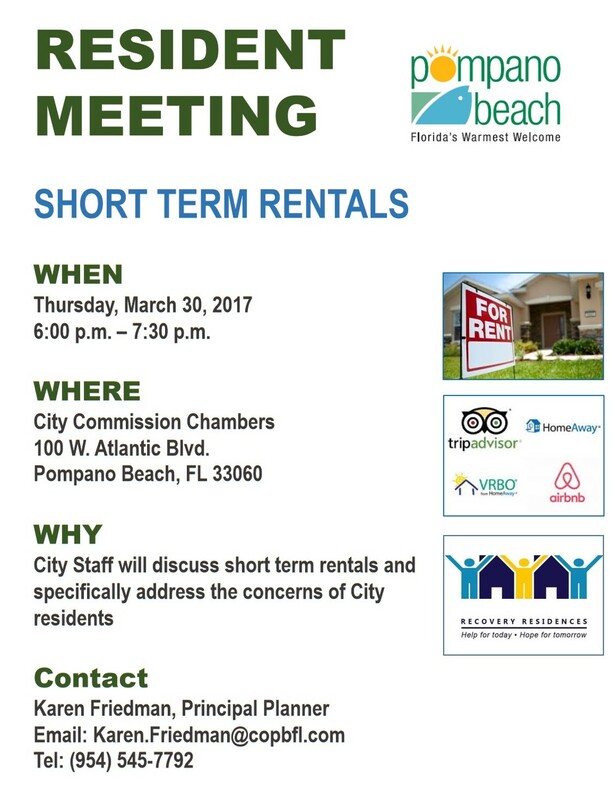 The intent of the Short Term Rental Staff Taskforce is to discuss and address the issues related to Short Term Rentals from a variety of disciplines. The Taskforce includes staff from the following departments and divisions: BSO, Fire Prevention, City Attorney, City Management, Planning and Zoning, Building Inspections, Business Tax Receipt, Code Compliance, Public Works, and CRA. The taskforce held Resident meetings on 02/16/2017, 03/30/2017, 06/5/2017 and presentation.